Dean Israelite is a South African film director, writer, and producer, best known for directing the found footage film Project Almanac and the 2017 reboot of Power Rangers. Israelite was born and raised in Johannesburg, South Africa, and studied Dramatic Art at the University of the Witwatersrand. He moved to Australia and graduated in Film and Television from Curtin University, then earned his MFA from the American Film Institute. His cousin is director Jonathan Liebesman. Israelite started his career with writing and directing several short films, including Acholiland. 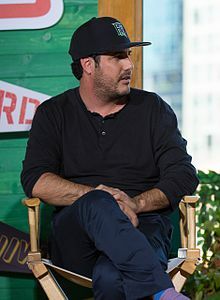 In 2015, Israelite made his feature film directing debut with the found footage science fiction thriller Project Almanac, based on the script by Jason Pagan and Andrew Deutschman. Michael Bay produced the film, which was released on January 30, 2015 by Paramount Pictures, grossing more than $32 million with a budget of $12 million. In February 2014, Israelite was among the directors who were being eyed by the Marvel Studios to direct the superhero film Doctor Strange, but later in June 2014 Scott Derrickson was confirmed as director. In June 2014, Israelite was set to direct the remake of the 1983 film WarGames for Metro-Goldwyn-Mayer, based on the script by Arash Amel. Israelite directed Lionsgate's Power Rangers film (2017), based on the screenplay by John Gatins, with a story by Matt Sazama, Burk Sharpless, Michelle Mulroney and Kieran Mulroney. ^ a b c d Fleming Jr, Mike (June 24, 2014). "MGM's 'WarGames' Reboot Lands Helmer Dean Israelite, Scribe Arash Amel". deadline.com. Retrieved September 8, 2015. ^ Thompson, Bill Desowitz,Anne. "Comic-Con 2014: 'Teenage Mutant Ninja Turtles' 3D Reboot vs. Low-Tech 'Project Almanac' | IndieWire". www.indiewire.com. Retrieved 2017-11-21. ^ "Power Rangers Movie Will Be "Mature but Still Playful," Says Director". ign.com. June 5, 2015. Retrieved September 8, 2015. ^ Kit, Borys (February 5, 2014). "Paramount Postpones Michael Bay-Produced 'Welcome to Yesterday' (Exclusive)". hollywoodreporter.com. Retrieved September 8, 2015. ^ "Project Almanac (2015)". boxofficemojo.com. Retrieved September 8, 2015. ^ Kit, Borys (February 20, 2014). "'Doctor Strange' Heating Up as Marvel Vets Directors (Exclusive)". hollywoodreporter.com. Retrieved September 8, 2015. ^ Siegel, Tatiana; Kit, Borys (June 3, 2014). "Scott Derrickson to Direct Marvel's 'Doctor Strange'". The Hollywood Reporter. Retrieved September 8, 2015. ^ Alexander, Julia. "Watch the first teaser trailer for the Power Rangers movie". Polygon. Retrieved 8 November 2016. This page was last edited on 17 January 2019, at 17:54 (UTC).